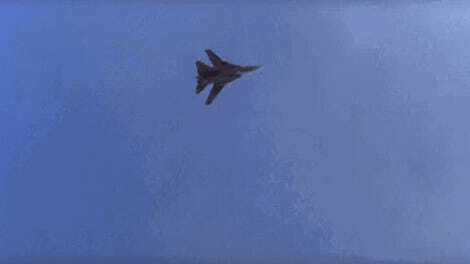 One of the most famous scenes from 1986's fighter pilot and volleyball blockbuster Top Gun is the part where Maverick and Goose get a close-up photograph of a rival MiG—while inverted. It’s an amazing scene from the pre-CGI era of Hollywood and a standout part of the movie. So what would it take do it yourself? That’s what photographer Blair Bunting set out to do, a wild idea born from a drawing on a napkin and a conversation between friends. It helped that one of those friends was Rob “Scratch” Mitchell from the Patriots Jet Team, a civilian aerobatics team based in California. That idea eventually blossomed into reality, and you can watch the results below. Thirty minutes into the flight we found ourselves at the moment of truth; it was time to find out if we could capture the image that Goose took in Top Gun. In order to do this, my jet would roll inverted at 500 feet off the ground. The second ship would roll in and ever so slowly creep closer, as I tried to take the photo all while calling out positioning to my pilot who relayed the info to the ever closing jet below. If this sounds insanely complicated, that’s because it is. The preparation that had taken place before this point was equally as immense. I had spent hours laying upside down off the side of my bed in my hotel room the night before so that I could learn how the camera operated while inverted. I went to the gym six days a week and exercised with a trainer that helped me build my endurance while being on top of my hick breathing to stay conscious (check out AGSM for fun). For an hour before we got in the jets I went through neck exercises to see if I could loosen it up enough to look behind myself more or less. All of this work boiled down to a shot that still would be 90% luck. I set the camera to its max shutter speed and used the first pass to dial exposure and distance rather than try to get the shot. Dangling by my shoulder straps looking straight down at the Earth speeding by below, a large jet started to emerge. I would call “forward, forward, forward,” and I could see the pilot below as he slowly dialed his plane faster all while looking me right in the eye, it was one of the more surreal moments I have ever been in. From there I would place the front element of the lens (which we had put layers of black tape around) flat against the canopy and shot as fast as the camera could shoot. To be honest, I had no idea what kind of shot we had, nor did I even look on the flight back, I was too damn tired. At that moment I wanted nothing more than a bottle of water, followed quickly by a glass of scotch.